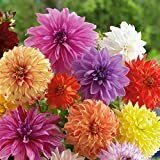 Tahiti Sunrise Dahlia - 2 Bulb Clumps - Vibrant Color! Dahlia for sale in the market is usually in the form of tubers or cuttings. The best time to buy and plant a dahlia is in the spring when the threat of frost has passed. Planting dahlias with well-established roots and 2 to 3 pairs of leaves brings the highest success. 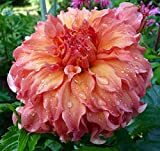 Avoid buying tubers that appear wrinkled or rotten and check for even a little bit of green growth as this is a good sign that the dahlia for sale is healthy. 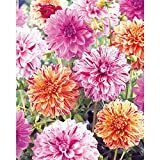 The colorful spiky flowers of dahlia generally bloom from midsummer to first frost and ranges in color and even size. Most varieties grow 4 to 5 feet tall. Location – Select a site with full sun. 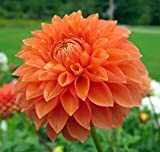 Dahlias need at least 6 to 8 hours of direct sunlight to grow more blooms. Less sun results to taller plant with lesser blooms. Choose a location with protection from the wind. If possible, it is best to place your dahlias in an area with morning sunlight. Soil – Dahlias thrive in a rich, well-drained and slightly acidic soil. If you have heavier soil, add some sand, peat moss, or manure to lighten and loosen the soil texture. Bone meal is ideal at planting time, put a small handful in the hole and work in well before planting tuber. Do not amend your soil with purchased soil mix which has been treated for weeds or has fertilizer added to it. These may burn your dahlia sprout. Planting – The planting hole should be slightly larger than the root ball of the plant and incorporate some compost or sphagnum peat moss into the soil. Plant the tubers whole with the growing points facing up in about 6 to 8 inches deep. Make sure that the crown is just above soil level. Bedding dahlias can be planted 9 to 12 inches apart while the smaller flowering should be spaced 2 feet apart. 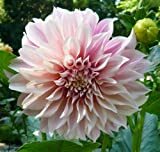 The taller, larger-flowered dahlias should be spaced 3 feet apart. Staking is recommended for dahlia cultivars reaching 3 feet or taller. 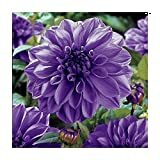 Water – Water sparingly after planting if the ground is super dry to help your dahlias get started. Wait until after the sprouts have appeared above ground before watering it well. Avoid overwatering as this can cause tubers to rot. Once established, provide deep watering 2 to 3 times a week for at least 30 minutes with a sprinkler or more if the weather is hot. Fertilizer – Use a low-nitrogen liquid fertilizer after sprouting and then every 3 to 4 weeks from mid-summer to early fall. 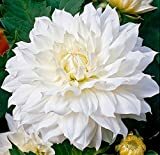 Do not over fertilize because it can retard blooming, and may cause weak or rotten tubers. Harvesting – only pick dahlias with full flowers. To avoid airlocks, re-cut the hollow stem ends under water. You may consider doing an occasional deadheading. This will prolong flowering and will make your plants look better. Deadhead by cutting off the heads and removing the whole dead flowering stem.